There's an important point to understand here. The blight that caused the potato crop to fail in Ireland was a natural disaster, but the famine that followed wasn't. Ireland wasn't the only country where many relied on potatoes as a major part of their diet, and it wasn't the only country where that crop was struck by blight. It was the only country where this crop failure cause a widespread and lasting famine. The United Kingdom had made a series of political decisions over the previous few centuries that made the Irish so dependent on the potato, and so dependent on scratching a living for large families from increasingly tiny patches of ground. Then they made another series of decisions, when the potato crop failed, not to divert any of the export crops to feeding Ireland's starving peasants, to make it easier for the absentee landlords to squeeze the peasants into giving up their land, and to obstruct foreign efforts to send food aide to Ireland. Notable sources of that help and of international pressure to allow the relief supplies in to Ireland were the USA and France, but they weren't the only sources. In some ways, Egan is a bit hard on the English, many of whom contributed generously to private relief efforts for the Irish. On the other hand, it was English commitment to its mercantilist policies, the deification of the "free market," and the profound English racism towards the Irish, that prevented the kind of large-scale efforts necessary to actually prevent the famine or end it once it began. Instead, the blight simply ran its course, over several years, while people starved, emigrated, or, condemned for crimes ranging from stealing a loaf of bread to feed the family to rebellion against British rule, and the population of Ireland was reduced by more than two million. Thomas Francis Meagher was one of the transported, shipped off to Australia. His crime wasn't stealing a loaf of bread. He was one of the leaders of the Rebellion of 1848, one of the leaders of the Young Ireland group of Irish nationalists more radical than the revered Daniel O'Connell. 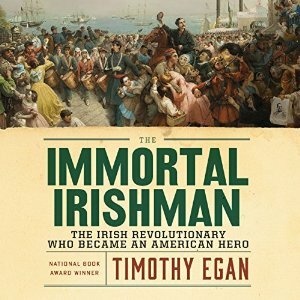 Egan gives us a detailed and compelling account of Meagher's growth from prank-prone schoolboy to young poet and orator to leader of Young Ireland--and then his continued growth, development, and public life after the 1848 rebellion. Sentenced to life in Australia--specifically, the penal colony on the island now called Tasmania but was then known as Van Diemen's Land, he escaped to the United States. That one sentence captures nothing of either the events, or the man Meagher was becoming. On arriving in San Francisco, he was feted as a hero, made his way to New York City, and very gradually got drawn in to the increasingly turbulent political events leading up to the Civil War. Meagher was still dedicated to the cause of Irish freedom, and initially felt the impending American Civil War, and the plight of the black slaves, was not his business. Yet despite himself it became his business, and he raised, and then commanded, and led into battle, the 69th New York Brigade--the Irish Brigade, or Meagher's Brigade. This Irishman, this Catholic, the man who was still a condemned and wanted fugitive, became one of the most storied heroes of the Civil War. After the war, he studied law, worked as a journalist, gave speeches, and became acting governor of the Montana Territory. He was serving as Acting Governor when he died. Egan does a much, much better job than I do of recounting all this. The role of Irish-Americans in the American Civil War is large and complicated, and there was an Irish Brigade on the Confederate side as well. Meagher himself didn't start out as an advocate of abolition, but evolved towards it eventually seeing it as the only path consistent with the same American values that had given him refuge. His was a colorful, significant life, affecting history on three continents, and Egan does a marvelous job of recounting it. A final, personal note: I've known for a long time that periodic outbursts of xenophobia have been one of the recurring features of American history, with the descendants--often the children--of each wave of immigrants condemning later waves as inherently unAmerican and diluting the pure and true character of the country. I hadn't quite realized until now that the same rants against the Irish in the 19th century, with simple word substitution, would be difficult to distinguish from today's rants against "Muslims" or "Mexicans." Food for thought!